Madeleine Moran is a singer, songwriter, and composer. She holds a Bachelor of Music in Composition from Lawrence University Conservatory of Music, where she studied both voice and piano. While attending the Conservatory, she sang in choirs and performed as a vocalist in improvised micro-operas. Growing up in Chevy Chase, DC, Madeleine performed in the school musicals while attending the Sidwell Friends School and was deeply involved with Imagination Stage in Bethesda. When Madeleine is not teaching at harmonic, she can be found singing as a choir member and leading the congregation with her solos as a cantor at St. Matthew’s Cathedral. She frequently performs her original songs at venues in the DC area. During the holiday season, she also can be found caroling at the DC Wharf with her a cappella quartet, Four Calling Birds. 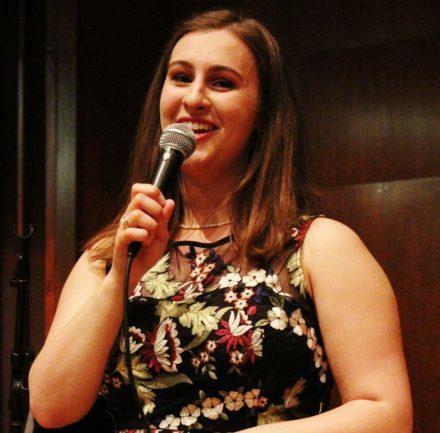 As a songwriter, two of her songs have been selected for performances by actors in the New York Musical Festival, the largest musical theater festival in the U.S. Another of Madeleine’s songs was selected as a finalist in the Just Music competition in Australia and was performed in City Recital Hall in Sydney. Madeleine’s choral piece, After Great Pain, was featured in a masterclass at the American Choral Directors Association Eastern Conference in 2018. The same piece also won the Baltimore Choral Arts Society Student Composition Project and was recognized in the Young Composers Third International A. D. Kastalsky Choral Music Competition. Madeleine’s passion for music theory has helped her to develop an accessible approach to teaching what many consider a daunting subject. In doing so, she is able to help her students better understand their music in both fun and meaningful ways.